Found this interesting article from the BBC website suggesting the origins of french wine came from Italian wine methods. Evidence of the earliest winemaking in France has been described – and it indicates Italian origins. Shaped vessels called amphoras, known to have been imported from the Etruscan people of Italy around 500 BC, have shown chemical evidence of wine. A wine press identified in the same region shows that the beverage quickly gained favour and launched a local industry that would conquer the world. The study appears in Proceddings of the National Academy of Sciences. There is also evidence that the wines contained herbal and pine resins, which may have helped preserve them for shipping. The history of wine development is a patchy one, principally because wine leaves behind few chemical markers that archaeologists today can ascribe definitively to wine, rather than other agricultural products. The earliest known examples of wine-making as we know it are in the regions of modern-day Iran, Georgia, and Armenia – and researchers believe that modern winemaking slowly spread westward from there to Europe. In 2004, Patrick McGovern of the University of Pennsylvania Museum led a team whose findings suggested that wine based on rice may have been developed in China at the same time or even before efforts in the Middle East. But details for many parts of the spread from the Middle East, including into France, remained unclear. Dr McGovern and colleagues have now pinned down another part of the story in the new study. “You could argue that it comes [into France from] farther north on the continent,” he told BBC News. The team was examining what are called amphoras, vessels designed for carrying both liquids and solids and for neat packing into a boat’s hull. The Etruscans, a pre-Roman civilisation in Italy, are thought to have gained wine culture from the Phoenicians – who spread throughout the Mediterranean from the early Iron Age onward – because they used similarly shaped amphoras. Further, it is known that the Etruscans shipped goods to southern France in these amphoras – but until now it remained unclear if they held wine or other goods. Dr McGovern’s team focused on the coastal site of Lattara, near the town of Lattes south of Montpellier, where the importation of amphoras continued up until the period 525-475 BC. They used a high-precision analytical tool called gas chromatography/mass spectrometry, which provides a list of the molecules absorbed into the pottery of the amphoras. The results showed that they did once contain wine – as well as pine resin and herbal components. But more surprising was the find of a wine-pressing platform, where grapes were ground and liquid drained off. “In a walled town like this, it is unusual to find a wine press from an early period,” Dr McGovern said. “Finding the chemical evidence for the press, that was a surprise.” The find is consistent with a pattern seen elsewhere – that wine is introduced from abroad, but a local culture eventually seeks to transplant the grapes and grow their own, local wine industry. “From there, [winemaking] spread up the Rhone River, the domesticated vine gets transplanted, it crosses with the wild grapes and all sorts of interesting cultivars develop – those are the ones that spread around the world. “Most of the wine we have today is from French cultivars, which ultimately derive from the Near-East cultivar via the Etruscans,” he explained. 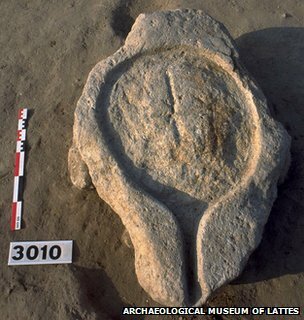 The methods used in the study have pushed the boundaries of what can be gathered chemically from archaeological remains such as those in Lattara. Regis Gougeon of the University Institute of Vine and Wine at the University of Bourgogne said the work was “undoubtedly a good example of technology and methodology leading the science”. “It was already acknowledged – in particular thanks to Patrick McGovern’s work – that viniculture might have travelled from the Near East to the Mediterranean Sea area about 3000 BC,” Dr Gougeon told BBC News.